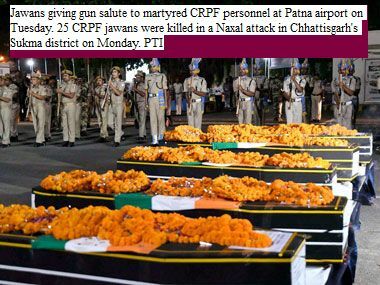 On 24 April, Maoist terrorists killed 25 CRPF (Central Reserve Police Force) men in the latest atrocity in Sukma district in the Bastar region of Chhattisgarh. The CRPF DIG (Deputy Inspector General) has spoken out to the media (http://indianexpress.com/article/india/at-sukma-camp-crpf-dig-speaks-out-kept-telling-chhattisgarh-govt-to-speed-up-road-4629834/)on how he kept telling the state government to speed up road development. He bemoans the “terribly slow pace of road construction” in that state. The road which could have been completed in a couple of days has dragged on for three years. While some point to the state’s indifferent attitude, there are others who tell a different story. They put the blame squarely on illegal mining, and the desperate desire for politicians and bureaucrats to make money out of this lucrative opportunity. .
Sukma is only one symptom of a malaise that has been corroding India. 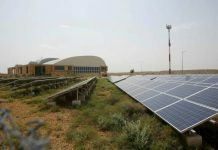 It is the most unfortunate consequence of political decisions taken to prevent infrastructure building in backward regions. 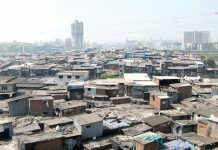 The correlationship between acute poverty, a sense of deprivation and exploitation on the one hand, and the financing of violence through illegal mining for personal and political gains on the other is always around — in Jharkhand, Chattisgarh, Orissa, the North East and Maharashtra. Maharashtra remains the most lucrative among all the states. Go talk to well-informed residents in Chattisgarh and in Jharkhand. They will tell you, rather discreetly of course, that the main source of funding for Naxalites comes from illegal miners. And why should illegal miners be interested in funding Naxalites? Well, the primary reason is that they want the Naxalites to prevent the building of roads, schools and other infrastructure that could make access to the areas of mining. If roads come in, people will then follow suit. With schools, hospitals and infrastructure coming in, you will soon have police stations. Worse, you will have people with mobile phones taking video clips of illegal mining. That would compel the authorities to act, and make the entire business of illegal mining that much more difficult. So it is best to prevent the development of infrastructure leading to these areas. But why should the state government go slow in the building of infrastructure? Well, if circumstantial evidence and anecdotal records are taken into account, the biggest beneficiaries of illegal mining are the politicians themselves. Illegal mining, it must be understood, is immensely profitable. The best indication of this can be found from the CBI’s own diaries. It note when investing the Saradha chit fund scam that over Rs.1,000 crore of the ill-gotten money had been invested in activities relating to illegal mining in the North East http://www.dnaindia.com/analysis/column-illegal-mining-why-did-the-dogs-not-bark-1987983). Once again, it is not mere coincidence that the biggest agitations there too are aimed at preventing building of infrastructure. Further proof of illegal mining in the North East can be found in photographs — http://www.businessinsider.com/photos-indias-illegal-coal-mines-2012-10?IR=T . Then take a look at the Justice Shah Commission report (http://www.business-standard.com/article/current-affairs/shah-commission-names-14-miners-for-cbi-inquiry-114080800967_1.html) which named 14 miners for a CBI enquiry. All were linked to illegal mining in Orissa. Once again, that state too has seen violent activity against the building of infrastructure. But Jharkhand and the North East are not the only territories where illegal mining flourishes. 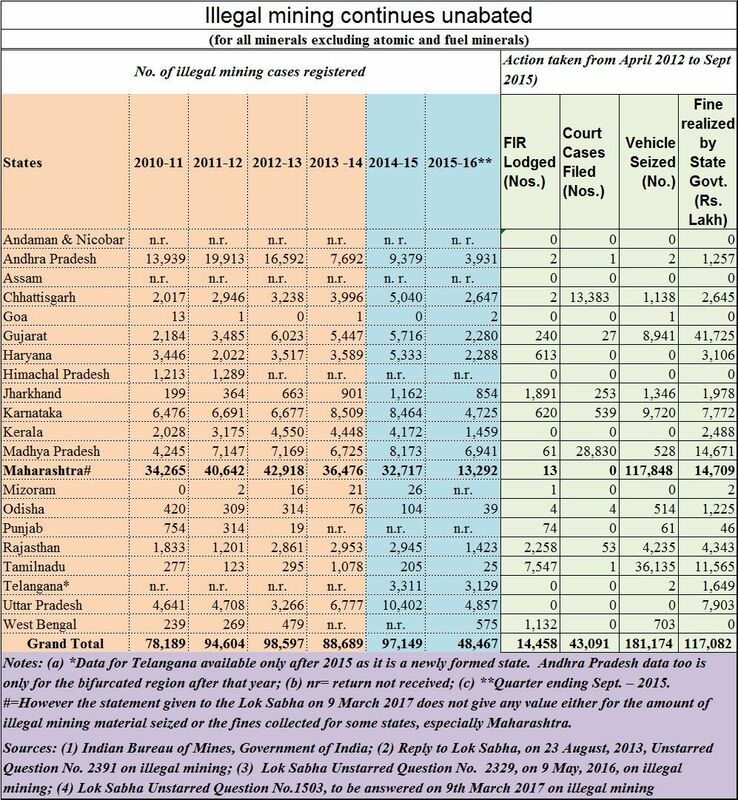 The state which accounts for the largest number of registered incidents of illegal mining is Maharashtra – see chart 1. The data which has been culled from statements presented before the Lok Sabha paints a damning picture for the state of Maharashtra. Illegal mining in Maharashtra takes many forms. One of them is illegal sand mining which is extremely profitable – thanks to the booming construction industry in recent years. All accounts point to the failure of the government to (a) create a reliable source of sand or alternative material for construction, and (b) to create suitable deterrence for violators. Sumaira Abdulali of Awaaz Foundation has documented enough cases for the government to follow up (http://www.moneylife.in/article/illegal-sand-mining-is-endangering-bridges-awaaz-foundation-demands-full-investigation/47748.html). The government appears to be quite slow in dealing with the culprits. Once again, not surprisingly, many of the incidents relating to illegal mining occur in territories where Naxalism proliferates. And the first target appears to be resistance to the building of infrastructure. 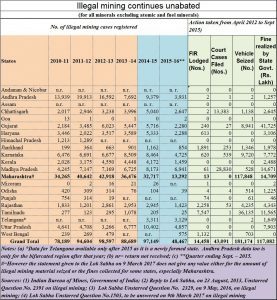 And the biggest beneficiary of illegal mining appears be be Maharashtra (http://www.asiaconverge.com/2016/08/illegal-mining-thrives-even-today/). States like Karnataka, Andhra Pradesh and Goa — which have been pilloried for allowing illegal mining to flourish — are but small fry when compared to the goings on in Maharaashtra. Just look at the data in the chart alongside. For year after year, Maharashtra has accounted for almost 40% of the reported incidents of illegal mining in India. The data source is the Lok Sabha (http://164.100.47.194/Loksabha/Questions/Qtextsearch.aspx). The table points to another interesting detail. Maharashtra appears to be reluctant to file its illegal mining cases with the courts. It seems as if it would rather have the executive settle the cases, than permit judicial intervention. Just compare Maharashtra’s record with that of neighbouring Madhya Pradesh (MP). Even though MP had fewer cases of illegal mining, it has filed more First Information Reports (or FIRs, a key document filed by the police before a case can be filed before the courts) than Maharashtra has. Then look at the number of cases MP has filed before the courts. Compared to Maharashtra’s pristine record of ‘zero’, MP filed 28,830. Clearly, MP appears to be more willing to see that justice is done. Finally, look at the fines collected. Gujarat, with fewer incidents of registered illegal mining than Maharashtra, managed to collect more fines. True Maharashtra impounded more vehicles. But it collected less fines. Moreover, there is no record of the impounded vehicles being put up for auction in a transparent manner. All the figures point to a regime more interested in private settlement than a focused effort to stomp out illegal mining. What is interesting is that Maharashtra does not provide any information to the central government on the value of the output that was illegally mined or confiscated. So much for transparency! Clearly, it appears that Maharashtra is more willing to register cases, and privately settle matters than go before the court and submit values of the material that has been seized. The paltry amount collected as fines appear to corroborate the view that political pressure is used to ensure that illegal mining continues. Even the trucks confiscated don’t appear to have been sold offer through a transparent auction process. To be fair, Chattisgarh has tried to stomp out illegal mining more forcefully than Maharashtra has. Watch the number of cases filed before the court. Even the average fines collected per registered case appears to be higher in Chattisgarfh than in Maharashtra. But, clearly, a lot more needs to be done to reduce illegal mining. One way would be to push through with the building of roads and schools and hospitals at a more frenetic pace than ever before. Another way would be to increase the quantum of fines by a factor of say ten, to make the cost of non-compliance significantly higher than the cost of compliance. At the moment, it is possible that the anger brewing over the death of 25 CRPF jawans will propel both the centre and the state to introduce such measures. But on the other, the lure of lucre is so powerful, that (for callous politicians and bureaucrats) even the cost of human lives is a small price to pay. That is horrifying and extremely worrying. Previous articleFutures in diamonds: Is SEBI promoting a scam?